Emeli Sandé finally making it to the U.S! The latest U.K. soul queen Ms. Emeli Sandé is finally making it stateside! The Brit Award winner performed an intimate NYC gig earlier this week for the industry people and is winning RAVE reviews. 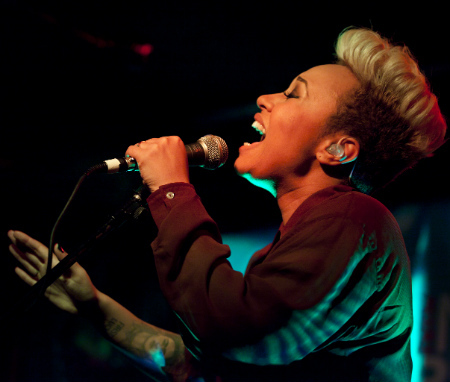 Emeli makes her way to Lala Land tonight for a VIP only gig a the Hollywood Forever Cemetery. Cori Spelling will be on hand to witness this rising star in person, and no, not because we’re VIP at ALL… it’s because we won tickets through a kick ace Emeli Sandé fan contest. Heyyyyyy. Keepin’ it real over here. In the meantime enjoy this gem! Grimes: Don’t call it pop music… well maybe you can.